There's a few pictures of the venue called BSA Space. Now for some pictures of the crowd. My splendid friends from Maine setting up when we arrived. I'm coaxing the eventual winner into entering the contest. 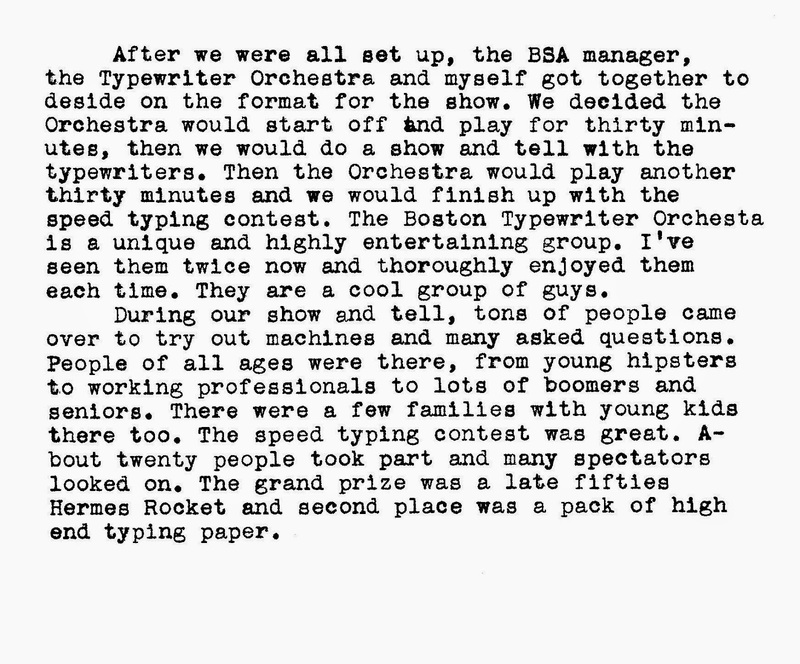 Here are a few pictures of the Boston Typewriter Orchestra. 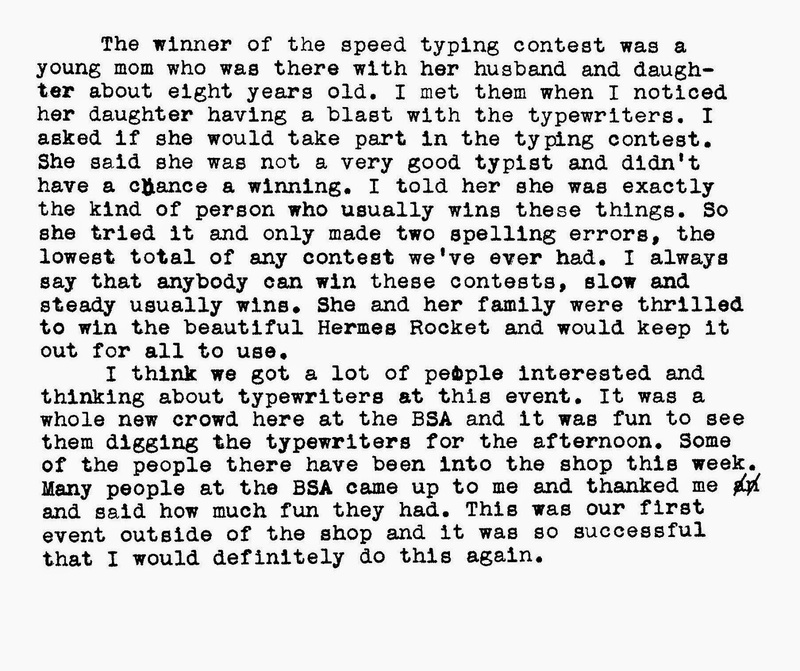 Click to watch a short video of typing contest. Congratulations on a splendid affair. The venue looks perfect. It was also very nice Abraham was able to make it. The Rocket was a superb prize. You would almost imagine typewriters were fairly commonplace and unremarkable. I think Boston has succombed. Which city next? Thanks for a great photo set and write up. Great space and great day! This is awesome, Tom! Great shot of you with the Hermes 3000. Thank you gentlemen and Janet- We had a great time at this event. I was worried about a low turnout but the place was packed. 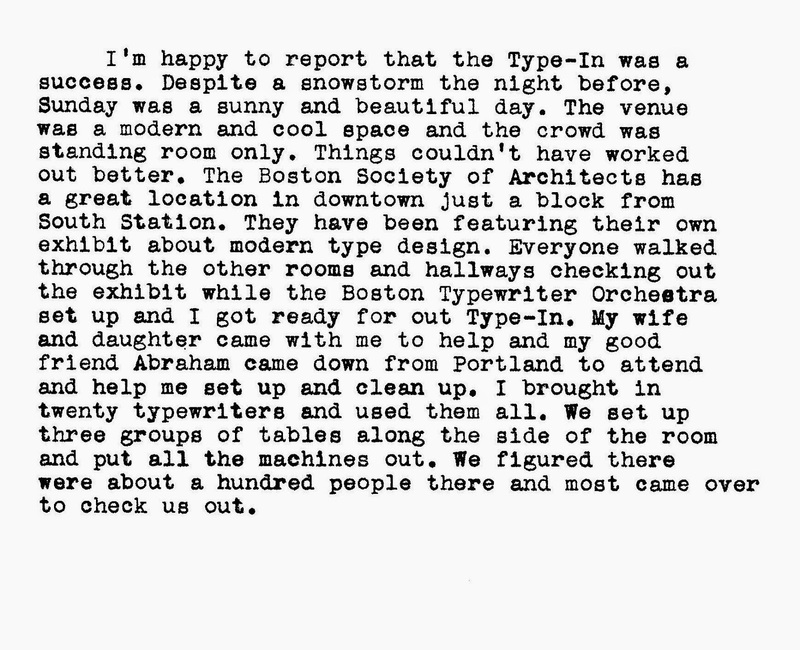 The typewriter revolution has taken Boston. What a nice, modern setting for a retro event -- or is it avant-garde? Richard- Many thanks! Like Rob says "Which city is next." I'm sure they do have some avant-garde exhibits and events there. We are definitely retro and proud of it. Looks like you guys had a heap of fun. Glad to see it! Keep on typing.